Amidst the disagreement over what to do about John A. Macdonald statues in Canada, one expert points to "counter-monuments" as a way to add historical context without removing what already exists. Amid a nationwide debate over what to do about John A. Macdonald's statue in Canada, one expert suggests erecting "counter-monuments" to offer historical context as an alternative to taking down existing monuments. The co-author of Memorials as Spaces of Engagement, Karen Franck has been researching counter-monuments — both in opposition to existing monuments and as memorials to bad chapters in history. She tells The Current's guest host Laura Lynch that the recent decision to remove a statue of Sir John A. Macdonald from the front door of Victoria, B.C. 's City Hall has sparked a useful dialogue about how best to remember our nation's controversial history. Why do you think so many people want to get rid of these statues, memorials rather than changing them or enhancing them? I think many people who are degraded and insulted by the monuments have been tolerating them for years. If we think of Confederate monuments in the southern United States, they symbolize a continuing oppression of people there — of black people there. So it's like adding one insult to another. It becomes the embodiment of a whole history. It becomes far more than that statue. So by removing the statue you're trying to redress the wrongs done in the past. The fact is a monument can't bear all that burden of telling history. I wonder what your thoughts are about how this debate over monuments is playing out here in Canada? Without the presence of that monument in the City of Victoria there wouldn't be as clear — and I would say also eloquent — discussion of this person's weaknesses and strengths. So I find it just remarkable that monuments that for years we ignored and passed by everyday are now sparking this kind of debate. Let's talk about some other monuments that you know about. There's one in Hamburg, Germany that's considered the original and this is the label on it: "counter-monument." What can you tell me about that? We need to make a little distinction here, the term counter-monument is an English translation of more than one German word. And counter-monument is sometimes used by James Young to mean a monument that doesn't have monumental qualities. And another kind of counter-monument is a monument that is actually opposing another monument. And is this the case in Hamburg? Yes it is. And that's where the German term [Gegendenkmal] originated. 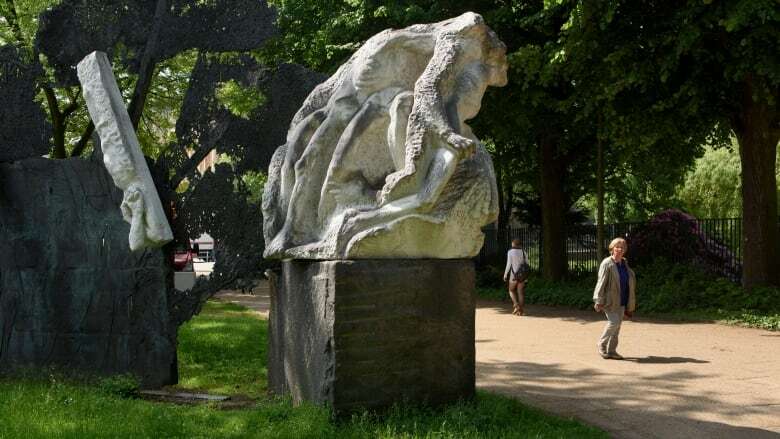 There's an existing monument in Hamburg that glorifies war that was built by the Nazis and for a long time in Hamburg there was a desire to remove this monument. In the end what the city decided was to leave it but to hold a competition with a monument that would express the opposite point of view: the critique of war. 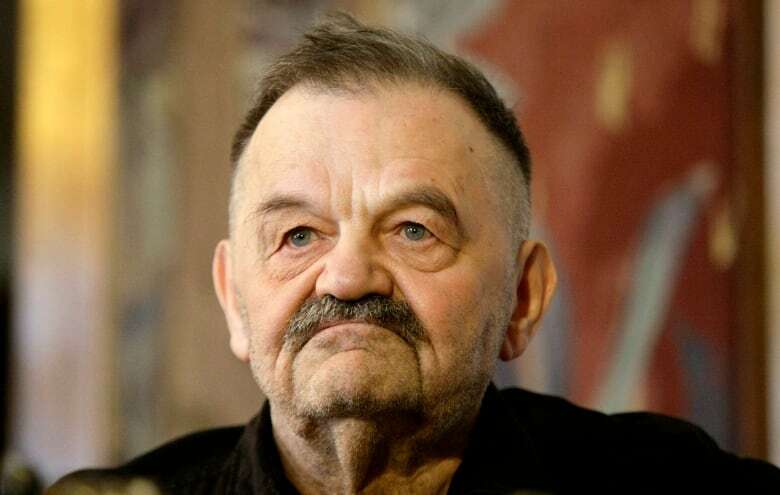 An Austrian artist won that competition and his original design was very powerful. It really made it clear its opposition to the original monument. The original monument is a very large stone block with soldiers parading around this block. 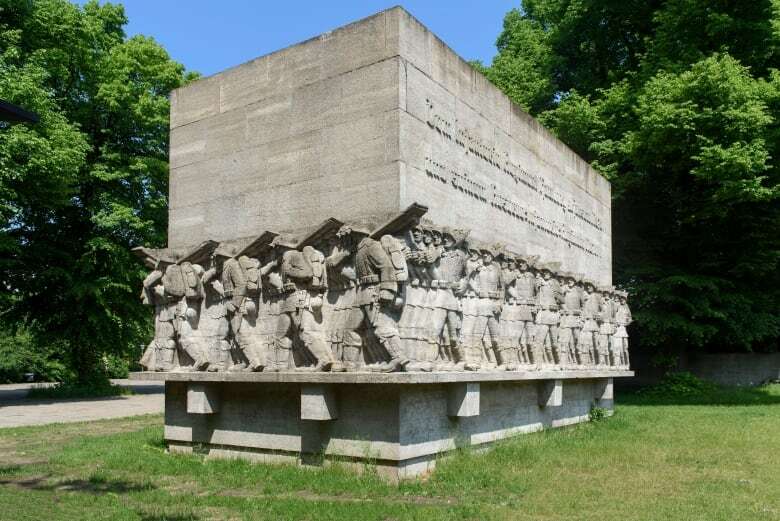 [The artist] Alfred Hrdlicka's original monument was repeating the same soldiers but having them basically walking into the ground surface and eventually becoming pavement of the surface as if they had been buried. So it was an incredible contrast to the original monument. 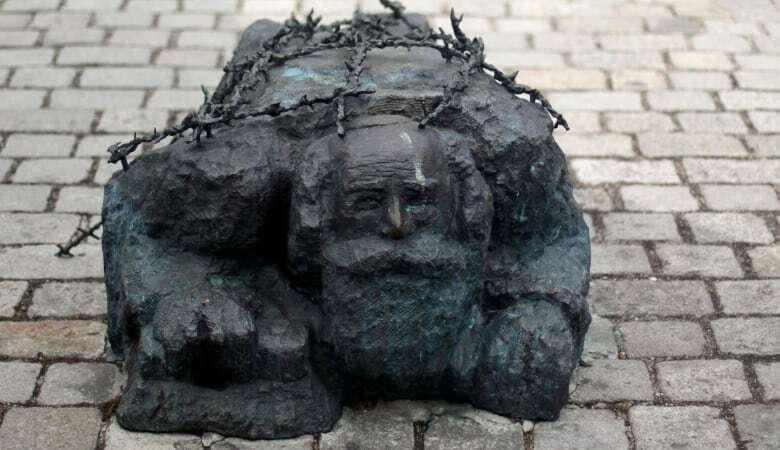 But it wasn't built and instead a series of rather abstract figures was built in its place which are much more ambiguous and signifies such things as the firebombing of Hamburg and it's quite difficult to interpret. I think the original design would have been much clearer. There's also a counter-monument in Australia called Reconciliation Place. What does that look like? Well that again is a series of sculptures. I think now there are 14 of them that represent different aspects of the oppression of the Indigenous people in Australia. The one that we illustrate in the article is about the separation of children from their families by putting them in boarding schools, as happened in Canada. But it's hard to understand that sculpture, you really need additional text. So this is the idea I've come away with from the discussion so far: that we expect monuments to do so much today and I'm not sure they can. So then we add text which is more explanation of the history that the art object itself can't tell. I think maybe we're expecting too much of the artwork. There's also the type of monument that is an entirely new and separate memorial to some of the more painful and shameful parts of history and you call these, anti-monuments. What do you mean by that? I mean that they're not affirmative of the past. So monuments to the Holocaust are not affirming or celebrating something that happened in the past but acknowledging it and trying to acknowledge the pain and suffering that it caused. Originally monuments were only on the positive side to glorify something that happened in the past. After World War II we adopted this other purpose. This segment was produced by The Current's Alison Masemann, Jessica Linzey and Allie Jaynes. Q&A has been edited for length and clarity.